The Amarr Mining Campus was founded to provide EVE University students with the opportunity to learn how to mine efficiently and safely. Our mission includes giving advice for solo mining and providing organised fleet operations. The Amarr Mining Campus enables a cooperative effort in mining operations and educates its members about the most basic and fundamental activity in EVE Online - without which you wouldn’t have your ships - Mining. You will learn how to maximize your productivity in a supportive environment when in Shared Cans and can frequently find ‘boosts’ provided from members in the AMC in ‘Bring Your Own Cans’. Members will also have the opportunity to manage provided spreadsheets to help with established operations or establish one of their own for community wide fleet operations. Our members aim to be helpful and engaging, helping with more advanced topics along the way, making the AMC an ideal place to practice mining, industry and research. The Amarr Mining Campus was initiated by Seranti Olerie, Ubermensch Invictus and Vger Starseed in March 2012. However, they have have retired their position in the AMC and moved on to other things in EVE. A number of criteria were set up to choose a suitable location for the AMC, which orientates around seclusion, accessibility to a central trade hub, profitability and also variation in activities around the AMC. The AMC is looking for EVE University members with an interest and a desire to invest in mining in the long term. This ranges from mining in ore belts in our systems to operating in wormholes, covertly harvesting gas in unknown space. All current members of EVE University are welcome to join us. Head on down to campus and say hello! You should bring your fastest ship and you can contact people on campus to ferry your other items to the AMC if needed. A lot of mining modules and ships are provided by the AMC’s own industry and internal logistics. There are also members in the AMC willing to ship items from the trade hubs if required, typically the local one. During wartime, remember not to bring what you can’t afford to lose. The AMC can provide ECM Griffins for free if requested. The Amarr Mining Campus is currently open to Alts from any Ivy League members. We do not currently accept +5 (NAP) or +10 (Friends) characters or Alumni. *Any Alt that participates in an AMC operation needs to be approved by an Amarr Mining Campus Officer in advance. The AMC members also provide facilities to alts; just ask when you’re in about alts! As for all EVE University campuses, the EVE University Rules take precedence. Do not buy or sell within 5 jumps from home station except for NPC seeded items such as skillbooks. This rule does apply to out of campus and out of corp ALTs too. During any campus activity join the AMC Channel in Mumble, or at least to be able to listen. Only EVE University mains are allowed on mailing list. Do not mine or stay undocked while AFK. This is for your own safety, as war targets can attack you without interference from CONCORD even in Hi-sec space. Help other campus members to learn. Running PVP ops in AMC is not forbidden, but kills and losses must be kept at an absolute minimum. The only exception to the allowed PVP ops is war targets. Which can only be engaged for rescue operations or with AMC Officer permission. Instead dock up till they leave. EVE University Rules of Engagement apply to any PVP activity within the AMC. Mission rewards must not be shared with an AMC fleet unless it is a specific mission fleet. Please refrain from taking over someone’s site if they’re in the AMC and respect other players in the game rights to the content of the sites even if they are not in the Uni. Local chat is advised to be kept open in a separate window and its display is set so that the minimum amount information is presented. Feel free to enter the AMC channel in the Mumble server, please respect the current conversation when entering. If there is specific fleet chatter, it is polite to use one of the provided channels for the chatter. Bookmarks in the Corporation Hangar, to help with the AMC please provide useful bookmarks or if people want to explore wormholes then please notify them and copy the bookmarks into the Corporation hangar. For mapping purposes we use the AMC-Mapper. Every member of the AMC is encouraged to join any existing AMC mining operation or to plan an AMC mining operation as a Fleet Commander on their own. There is no need for special skills to run or join a mining operation. If you're planning on running a mining operation, you only need a spreadsheet and people to mine, haul, and scout. Please try to ensure that there is only one organized AMC mining operation at a time. A majority of the time AMC Shared Can operations are announced on our Mailing List so everybody can see if it's possible to join the operation. But there are also spontaneous operations that aren't announced beforehand. We also run frequent BYOCs that you can join. Simply ask in the chat channel for information on what is going on. To participate in a mining fleet you may use any mining capable ship fitted with mining lasers. You can also use any appropriate hauling or boosting ship after consulting the fleet commander. You do not have to bring any specific type of ship but use the most appropriate for your fleet role. If you require a Venture or Mining Barge, Ventures are free in the Freshman hangar, and barges can be purchased at a reduced cost. A BYOC (Bring Your Own Can) mining operation involves an Orca pilot providing boosts to your mining yield and mining laser range, sometimes also reducing capacitor usage that your mining lasers can be cycled quicker if needed. All BYOC operations are run by volunteer boosting pilots. It is courteous, though entirely optional, to gift the Orca pilot with a tip as a thank you for the increased yield. Anyone can lead a BYOC, and being a boss is easier than you think. Shared Can mining operations are organized by a volunteer fleet commander. The fleet commander organizes for boosters and haulers to be available during the operation. Every AMC member can join the mining operation for as long as they wish. After the mining operation, the ore is sold with the AMC Buy-Back Service and divided between the members according to their time spent in-fleet. For information on running a Shared Can fleet, click here. For those able or willing to 'huff gas' in wormhole space, the AMC members often provide opportunities to collaboratively harvest gas from wormhole sites. There are no restrictions on the ships you want to fly in these operations, the ships can range from combat based ships to Prospects for better gas mining. These are similar to 'BYOC' operations however boosts may not be available. Gas sites are found via exploration near AMC and familiarity with the mapper is very useful. There is opportunity to mine out asteroids in wormhole space with others in the AMC generally and sometimes the capability of mining ore in a shared can operation with ships provided for the duration of the operation. During missions or in general, there are sites to mine out in the AMC that have better or other ores than the ones typically found locally. These can be spawned by missions or by running combat sites. There are also sites that spontaneously appear around the local systems which are available to mine. Ice mining is also supported by the AMC and Ice mining related modules are required for profitable ice mining. Coordination for ice mining is often done via AMC Slack. One of the services of the Amarr Mining Campus is our AMC Buy-Back service. This service lets you sell your ore, gas, ice or minerals directly within the AMC Home System and some of the surrounding systems. This service offers you a higher pay out than a new player would get without significant skills and standings. As both get the higher value of mineral cost along with benefits of sell orders in Jita where we sell. Along with the saving of logistics of moving it. The service fee for this service is 2.5% of refined value of ore,ice or gas submitted. Which is automatically put into sheet used so you don’t need to work it out. With this fee we fund the AMC services and hangers. For example the Half-Priced Mining Barges service is funded out of this isk. With this point in mind, it is recommended to use this service. As not only do you save a lot of effort and get more isk. But help out future AMC members and campus. When you use this AMC service, please refer to the corresponding Wiki Page page. The AMC Refining Service offers our members a perfect refine of ore from AMC Refinery. This allows members to get more out of their ore or ice than would normally. To allow us to run the AMC and all related services we take a small handling fee for this service which is 2.5% same as our buyback service. The outcome of the service will be higher than a perfect refine with 0% tax in an NPC Station. For more information and to submit your refining request, please visit the AMC Refining Service wiki page. 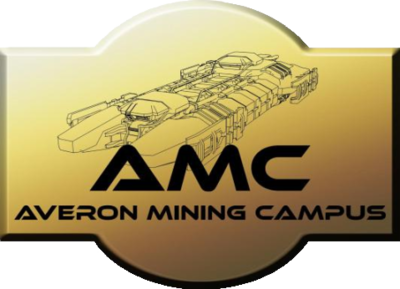 If you are concerned that you do not have a usable ship for mining when you join the Amarr Mining Campus, the AMC offers a free Venture. The AMC also provides you with a slightly reduced cost Mining Barge. To get the Venture you can take one out of the Corporation Hangar in the Home Station. Please make sure to follow the instructions from the Hangar section. While you are in the Amarr Mining Campus you can make use of the following Modules to fit your ship to optimize your mining (all available items are within the corporation hangar in home station). If you do not see an item in the corporation hangar, please contact an officer about the availability of the module you are seeking. There is also a large number of T1 and T2 modules and ships available for purchase from the AMC, a complete list is here, just contact an officer to request these. We provide Station Containers to help you organize your hangers. Ask an officer and will provide you with 10. In your stay at the Amarr Mining Campus, the AMC offers half-priced Mining Barges (Retriever, Covetor, and Procurer) to members. These Mining Barges are made available at half of Jita price, and are available at home station; additionally, you may purchase any mining modules, that are not available for free through the corporation hangars, at full Jita price. This service allows new AMC members to get started with mining very quickly once making their way to the campus. While the AMC is excited to offer this service, we do ask that you limit half-priced Mining Barge requests to one at a time. Please, contact an officer to make a request of this service. This page was last modified on 6 February 2019, at 08:31. This page has been accessed 123,959 times.